The Sugar + Shake Maui AgFest 2014 Experience: More Days, More Food, More Responsibilities. 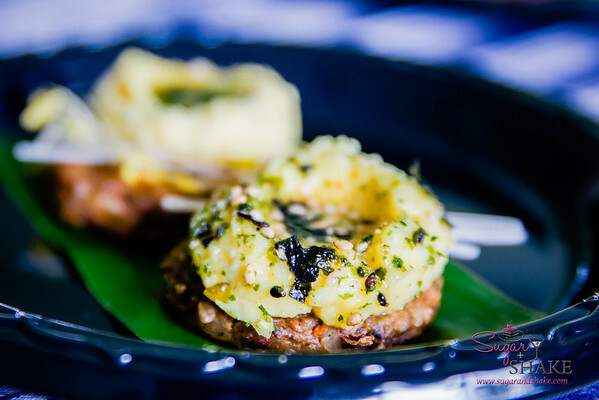 This year, we were honored both of us were asked to judge the Maui AgFest Grand Tasting of 12 chefs’ dishes showcasing local produce. In addition, the weekend started early—Thursday night—with a Grown On Maui dinner featuring four Maui chefs and four visiting chefs from Canada to benefit the Maui Culinary Academy. And, as if we needed to eat more, we were treated to a special dine-around on Friday night at Capische?, Migrant and Ka‘ana Kitchen, and on Saturday after the Festival, a barbecue feast. Phew! This post will cover just the Grand Tasting at the AgFest. As with previous years, each chef was paired up with a farmer and a featured ingredient to use. This year, however, there was a twist: Each chef was also assigned a particular culinary influence in homage to the various ethnic backgrounds that comprised Maui’s plantation heritage. This was my first time judging—Shake judged two years ago—and I was determined to make it through all the dishes. So here we go! One note before starting, though: I wish that the chefs had come out to introduce their dishes before we tried them. Two of the six judges on the panel were from Canada and weren’t familiar with many of the items, and even I wasn’t too sure what a few things were. After coming home and doing some research, I realized that I should have given a few chefs less credit for creativity because I didn’t know that the dish they’d made was a standard ethnic dish and not a reinterpretation. I think some other chefs would have gotten more credit for creativity or ingredient use because all we had to go on were the brief descriptions on the tasting program and I know that so much more went into these dishes than could be expressed in one sentence. OK, now here we go! First up: Chef Eric Faivre (Grand Wailea) with Heidi & Tommy Watanabe (Watanabe Processing) — Chap Chae with Crispy Pork Belly in Heidi’s Manoa Lettuce Cup, Kim Chee. Culinary Influence: Korean. 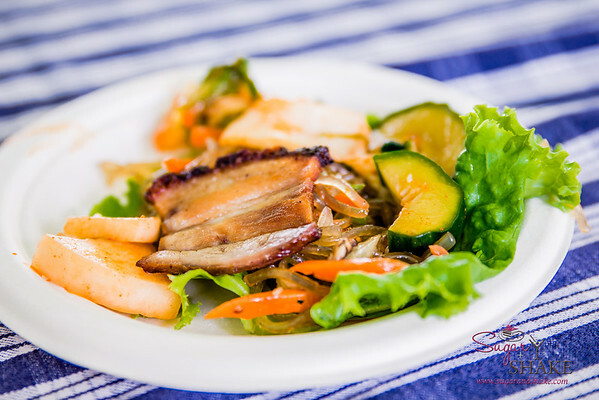 The highlighted item in this dish was pak choy (a leafy green vegetable), which was in the Chap Chae (a Korean noodle dish). Chef Eric did a nice job with the Chap Chae, however, it didn’t particularly showcase the pak choy. I found only a few shreds in my serving. 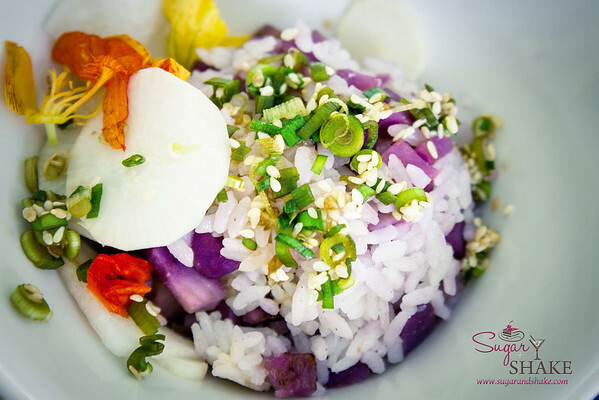 Chef Jojo Vasquez (The Plantation House) with James Simpliciano (SimpliFresh) — Goguma-Bap (Sweet Potato Rice). Culinary Influence: Korean. Third Place, Judges’ Choice. Chef Jojo was one of those who snuck an extra point out of me in the creativity score because I wasn’t familiar with goguma-bap. However, this was still one of my Top Three dishes. It was very lightly sweet and I just loved the lemongrass-y and sesame taste of the topping. Shake is still in shock that I liked it so much, because I hate sweet potato. I would have eaten the entire bowl except I was worried that I would get too full to finish the other ten dishes to come. 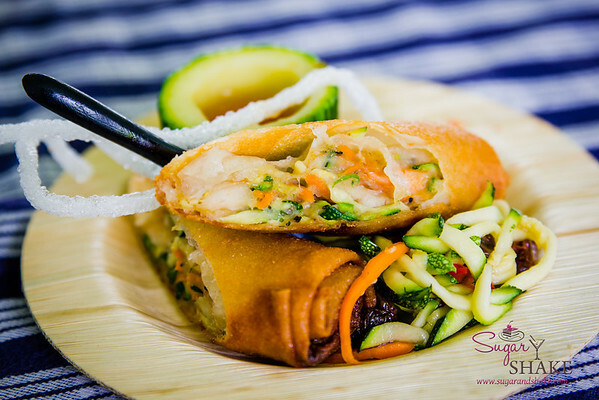 Chef Tylun Pang (Kō at the Fairmont Kea Lani, Maui) with Fernando Traje (Traje Farms) — Zucchini and Shrimp Lumpia with Zucchini Achara. Culinary Influence: Filipino. Second Place, Judges’ Choice and Fan Favorite. We talked with Chef Tylun at the Grown on Maui dinner on Thursday. “What did you get assigned?” we asked. “Zucchini. And Filipino,” he replied. Despite this setback, Chef Tylun and his team did a great job. 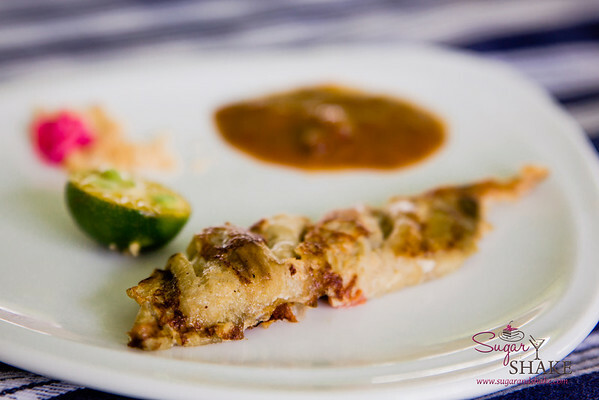 Filipino cuisine does use different squashes, but he did something rather unexpected and used the zucchini as a filling for lumpia and also for achara, which is a Filipino pickled vegetable dish—it’s typically made with green papaya. Obviously it worked out for him, earning him second place with both the judges and the public. I ate it all, even though I meant to conserve stomach space. Chef Gevin Utrillo (Japengo at Hyatt Regency Maui Resort & Spa) with Noel Escobedo (Escobedo Farms) — Tortang Talong (Eggplant Omelet) with Kare-Kare Ragout (Oxtail Peanut Stew), Shrimp Fry and Calamansi. Culinary Influence: Filipino. This was another dish that turned out to be a fairly standard example of the designated cuisine. Tortang talong is essentially the Filipino version of the Korean eggplant jun (or jeon)—eggplant dipped in an egg batter, then pan fried. A nice addition to this was the kare-kare ragout, which I heaped on top of the eggplant and then added my Filipino condiments—the calamansi and shrimp fry (teeny little fermented baby shrimp—the pink stuff in the photo). Not sure if that’s how Chef Gevin meant it to be eaten ( this would have been a great dish to have the chef explain to everyone at the start) but it seemed the logical way to go. I wouldn’t say that it was all about the featured ingredient, but it obviously formed the backbone of the dish. 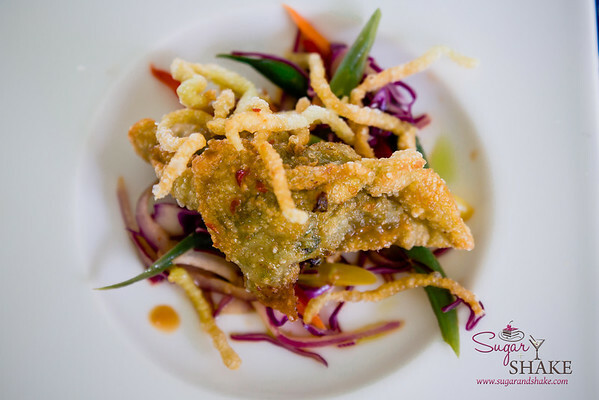 Chef Marc McDowell (Mākena Beach & Golf Resort) with Emanuela Vinciguerra (Kumu Farms) — Long Bean and Pork Potsticker with Long Bean Dumpling Wrapper and Firecracker Slaw. Culinary Influence: Chinese. Third Place, Fan Favorite. This dish was voted the Third Place winner by the voting public. It was quite tasty and Chef Marc really stuffed the pot sticker with beans—something I gave credit for since many people would shortchange the beans and go for more pork to make it more popular. In these, the pork just accentuated the beans and added flavor. 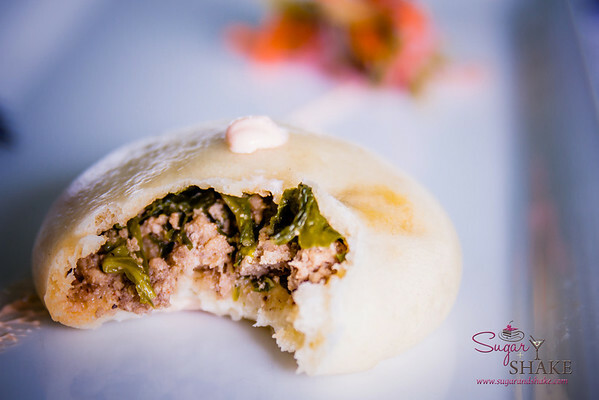 But the really creative use of the featured ingredient was incorporating them into the dough for the pot sticker wrappers. I would have liked to have heard more about how he did that! 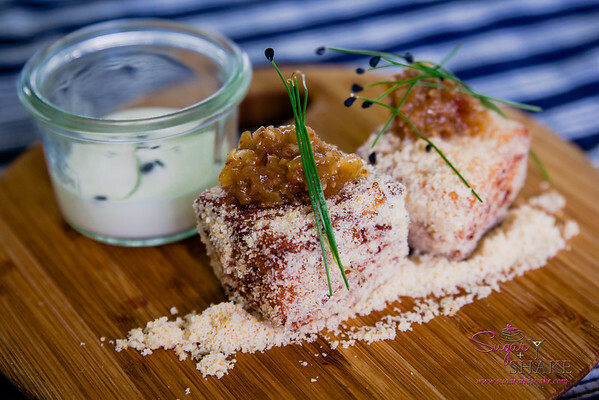 Chef Isaac Bancaco (Ka‘ana Kitchen at Andaz Maui, Wailea) with Chauncy Monden (Kula Country Farms) — Onion Malasadas with Sour Cream, Onion Seeds, Onion Jam and Onion Dust. Culinary Influence: Portuguese. First Place, Judges’ Choice and Fan Favorite. Chef Isaac’s very inventive twist on sour cream and onion chips (he even crushed some of those into the malasada batter!) in the form of a Portuguese doughnut won the day. This dish—deservingly so—was voted Number One by both the judges and public. It was onions everywhere, and in a great way—there was no harsh, overpowering taste of onions. You didn’t feel like you’d have to avoid talking to people after eating it. We knew what he was going to make (he told us about it when we had dinner at Ka‘ana Kitchen for my birthday last month) but I still wasn’t prepared for this savory goodness. We didn’t try the malasadas that night, so I didn’t know that Ka‘ana makes theirs a bit smaller and denser than most others, which really worked well for this savory preparation—sort of like an ultra-chewy, onion-dusted dinner roll. I actually threatened Chef Lyndon Honda, who had the job of clearing the judges’ table after each dish, that I would stab him with my (flimsy plastic) fork if he didn’t stop trying to take my plate. 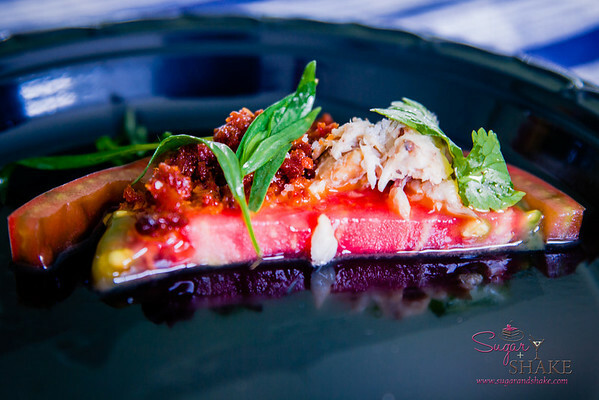 Chef Sheldon Simeon (Migrant / Māla Wailea) with Olowalu Nui Farm — Olowalu Tomato, Confit ‘Ahi Kama, Hawaiian Chili “Piri Piri,” Chouriço. Culinary Influence: Portuguese. Chef Sheldon had some incredible tomatoes to work with, and I would have liked to have had more of them in this dish. The ‘ahi kama confit and spicy chouriço were extremely flavorful, so with only one half-slice of tomato, they really took over the dish. With more tomato, this one would have cracked my Top Three. I liked that it was a light, fresh, cool dish. 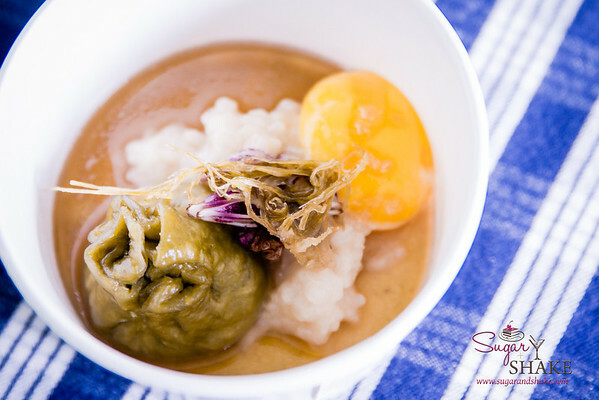 Chef Jeff Scheer (Maui Executive Catering) with Gerry Ross (Kupa‘a Farm) — Mana‘ulu “Lau Lau” (Taro Steamed Sticky Bun and Taro Leaf Dashi). Culinary Influence: Hawaiian. Here’s another dish that I wish had been explained by the chef. We met Chef Jeff at the post-Fest BBQ later that night and he told us more about the dish and what went into it. The lau lau pork filling had been piped in so they could steam the “bun” (which consisted of a taro-based wrapper—sort of like a little pot sticker). Very cool. I loved the flavor of the dashi (broth), but I did feel the bun itself could have used more flavor. In case you’re wondering, the yellow thing is a soft egg yolk; Chef Jeff had access to a big supply of eggs from young chickens—younger chickens lay smaller eggs—they’re good for dishes like this, but most people don’t want the small eggs. Chef John Cadman (Maui Breadfruit Company) with Ian Cole (Breadfruit Institute) — ‘Ulu (Breadfruit) Hummus on Maui Taro Burger. Culinary Influence: Hawaiian. I liked the flavor of the hummus, but it was so spicy I could only take one bite. Chef John makes and sells ‘ulu hummus; even without having known that at that time, I felt like this was a bit of a “safe” dish to make. I have discovered, though, that Chef John also makes pies out of ‘ulu—I think that would have been a better option to present (more creative) if he was sticking to recipes he was familiar with. Though, I’m not sure if there was a rule that only one chef would be making a dessert. I did appreciate the incorporation of the taro burger to make it a more interesting presentation and add more Hawaiian food elements into the mix. Chef Wesley Holder (Pūlehu at The Westin Kā‘anapali Ocean Resort Villas) with Jamie Shishido (J. Shishido Farm) — Kai Choi Lup Cheong Manapua. Culinary Influence: Chinese. The joy of choy! No really, there is a class that’s sometimes offered through Kapi‘olani Community College’s culinary program called that. It explains the various leafy green Chinese vegetables, their differences and what to do with them. I felt like I needed that class before tackling this judging. I wasn’t sure which choy kai choi was, but since Chef Wes’ dish had the one vegetable-y looking item, it was easier for me to identify how he’d used it, as opposed to the Chop Chae by Chef Eric earlier where I wasn’t quite sure if he’d used it in other elements of his dish. This was a creative use of the kai choi—not what you’d expect to be done with a leafy green—and the filling was a good balance of meat and greens. Manapua was also a cute idea for a festival like this since it’s a hand-held food that’s easy to eat. The Canadian judges, who were seated next to me, asked if it was supposed to be a room temperature dish. I rarely get my hands on a steaming hot manapua since I usually encounter them at the office when someone brings them in as a treat, so to me, yeah, they kind of are a room temp thing. 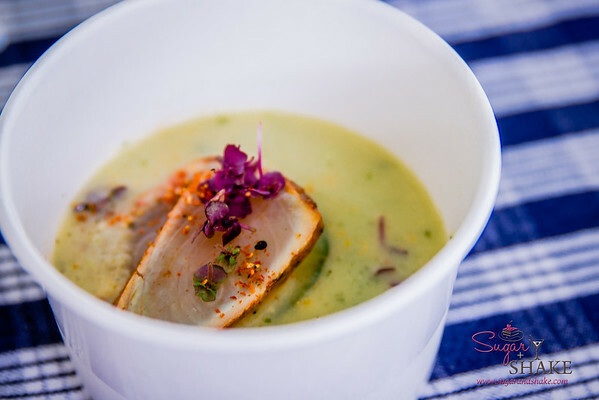 Chef Bobby Masters (Hula Grill Kā‘anapali) with Bryan Otani (B. Otani Farms) — Chilled Japanese Cucumber Soup with Shichimi Cured Ono Pastrami Culinary Influence: Japanese. Shake really enjoyed this dish—he ranks it in his Top Three. I thought it was tasty, but saw only a nod to the Japanese influence with the shichimi (seven pepper spice) ono and some micro shiso garnish. It was nice to have a cool item, though! There was a very nice gazpacho taste to the dish, but I would have liked to have seen more (and more creative) use of the cucumbers. Chef Chris Schobel (Fat Daddy’s BBQ) with Geoff Haines (Waipoli Hydroponic Greens) — Chilled Watercress and Mint Soup with Watercress, Yuzu & Mint Sorbet. Culinary Influence: Japanese. And now we come to the final dish! I felt like it was easier for me to get through all 12 dishes this year than last year. I’m not sure why since I did end up eating the entire dish from several chefs, even though I’d planned on only tasting because I had such trouble trying them all last year. Looking over last year’s dishes, I think there were several that were much heavier—there was a lot more meat and starch last year. Chef Chris competed last year for Hula Grill, but this year he has his own new place, Fat Daddy’s BBQ. I’m glad he catered the post-event dinner so that we could try his BBQ food, since this was totally different from that style! 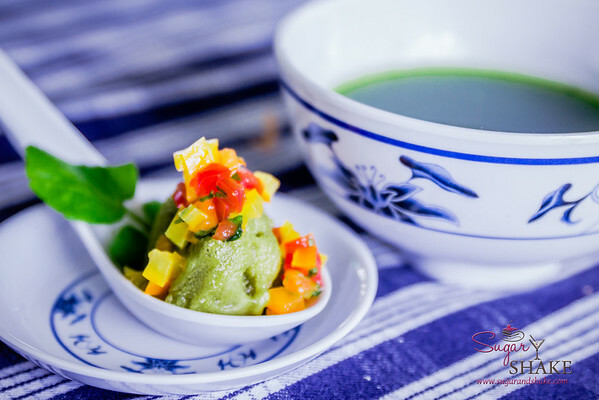 I’m not sure if he was told to make a dessert or he just did (last year he also did a cold soup, so maybe it’s just his thing) it since watercress makes for a nice finishing dish. The soup was on the bland side—the judges seemed to agree it didn’t really add anything to the overall dish. But the sorbet was fantastic! Slightly sweet and tangy, it was super refreshing. I dipped mine into the soup and took bites of it together for the sake of tasting the complete package. But I would have really been happier with several scoops of sorbet to give myself a brain freeze. This was gravy and French fry heaven. Everyone says you have a second stomach for dessert. 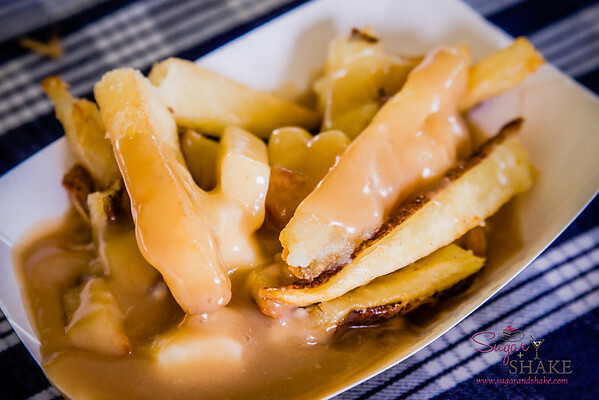 I think I found another one for poutine. Shake related a hilarious story after he came back from procuring this for us: Apparently, he had been in line behind a guy who asked for the poutine with no gravy. “Yeah, but your day will be that much sadder,” answered Chef Pierre. I bet it was really sad because that was some awesome gravy. So that’s it for this year’s Grand Tasting at AgFest! What would you have picked as your Top Three? (Mine were Chef Isaac’s malasadas, Chef Jojo’s rice and Chef Tylun’s zucchini.) I’ll be posting more about our AgFest weekend adventures over the next couple of weeks. Disclosure: Sugar + Shake were hosted by the Maui Visitors Bureau, the Maui County Farm Bureau and The Grand Wailea. Travel and accommodations were provided by the hosts, as well as entry to the Festival and the Grand Tasting, but no compensation was received for this post, and the opinions expressed are strictly my own.